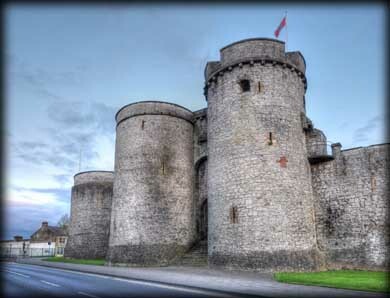 Located on King's Island in the heart of medieval Limerick, King John's Castle was built between 1200-1210 at the bequest of the ruling monarch. The castle was built on the site of an earlier fortification. It's purpose was to defend the bridge crossing the river Shannon and protect the Norman Kingdoms on the east side of the river from the Gaelic tribes on the west side. The five sided rectangular castle with it's high curtain walls is unusual in that there was no keep. The walls of the castle were severely damaged in 1642 in the first of five sieges of the castle in the 17th century. A military barracks was built within the castle walls in 1791 and in 1935 Limerick Corporation removed part of the wall and erected 22 dwellings. These have since been demolished. In 2013 the castle re-opened after a 5.7 million revamp. Among the improvements were a brand new visitor centre with interactive exhibitions. Visitors can also see the 13th century undercroft of the officers’ quarters which were excavated in 1993-1995. We arrived a little too late to do the tour but hopefully we will be back soon. 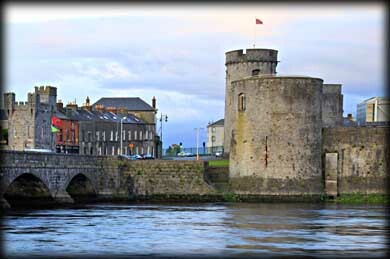 Situated: On King's Island on the east side of the Shannon at the southeast corner of Thomond Bridge. Discovery Map 65: R 5770 5779. Last visit April 2012.